Dolly in miniature form. Dolly appeared on the scene in 1913, following the US presidential elections of the previous year. As Woodrow Wilson won the election, Dolly’s body sported the blue colours of the Democrats, combined with the red and white of the US flag. Up until 1918, Dolly was issued in three further colour combinations, and then again in her original colours in 2013. 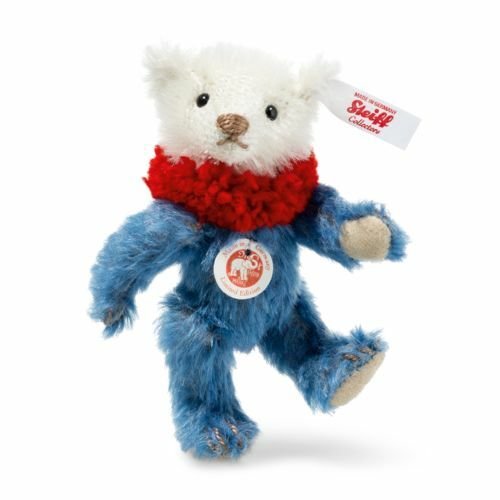 And now she is making yet another appearance in the Mini Teddy bears series: 1,500 bears are available with gold-plated Button in Ear and the classic red woollen ruff. Particularly in these times, Dolly can also be seen as a statement, underlining the importance of democracy for us all.